If you work in an office then you are likely to press WinKey +L to stop co-workers fooling about with your settings or spying on your documents. 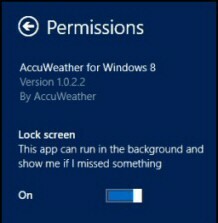 The Windows 8 Lock screen can display Metro-style apps such as Calendar or Email so that you can see any updates with out unlocking the screen. Probably the easiest way to activate this screen is to left-click your account’s icon, then select ‘Lock’ from the drop-down menu. However, if you want to Personalize this screen you need to find the underlying Lock screen options. This involves the Windows 8 Settings, thus begin with WinKey +w. Alternatively, at the Metro start screen, type ‘L o c k’, but then switch from Apps to Settings, see screenshot right. At the PC settings, make sure you select Personalize, then Lock screen. Gotcha. I have yet to find a way to drag and drop apps to change their order. The only way I can get my desired sequence is to unpin then repin the desired app. 1)	Choosing another picture is easy. Recommendation choose Calendar or one of the Weather Apps. Check in the Metro-style App’s settings that it has the ability to display on the Windows 8 lock screen. Call for the ‘Charms’, Settings (Charm), select Permissions, and make sure that ‘Lock screen’ is on. If there is no lock screen permission, then that app does not have the ability to display when you press WinKey +L. Note: You access these PC Settings via the Metro interface, my point is the they are different from ‘Personalize’ options seen if you right click the desktop and choose: ‘Personalize’ from the shortcut menu. Your lock screen may contains elements of Windows, user, and app content. The date and time cannot be customized, other than adjusting your system time settings. Network status is always displayed. You only see the battery icon on laptops and tablets. In addition you can specify up to seven apps but only one can display the text of its latest notification. Improved in Windows 8.1 to include photo slideshow and other dynamic features. The app tile’s current badge. The text from the latest update notification. Toast notifications set out in the apps manifest, ToastCapable="true". The best way to see the differences is to set different backgrounds for these two settings. Screensaver settings: At the Metro UI type ‘Screen Saver’, check the bottom right of the screen, for the experiment set to 1 minute. Lock Screen settings: At the Metro UI type ‘Lock Screen’, click on Settings, then click on the Lock Screen Icon. Now look at the PC Settings, Lock Screen (Top middle of the screen). Probably the easiest way to activate the Lock Screen is to left-click your account’s icon and then select ‘Lock’ from the drop-down menu. Once you have observed the background, unlock the screen, go back to the desktop and wait for the screen saver timeout to elapse. Indeed, this highlights a difference the lock screen doesn't activate unless you explicitly click on lock, or type WinKey +L. Another important difference is that with a password is optional to resume from the Screen Saver, whereas you cannot get past the Lock screen without your password. The benefit of this command is that you could create a Scheduled Task which locks the Windows 8 machine; you could set a trigger on the initial logon or idle. The reason for doing this would be to prevent people having access to your machine if you left the room. The advent of touch screens brings the need for new ways of closing programs in general and Apps in particular. What you find is that the old ways of ending programs such as Alt +F4 are being replaced with a finger’s swipe or a mouse’s hand.